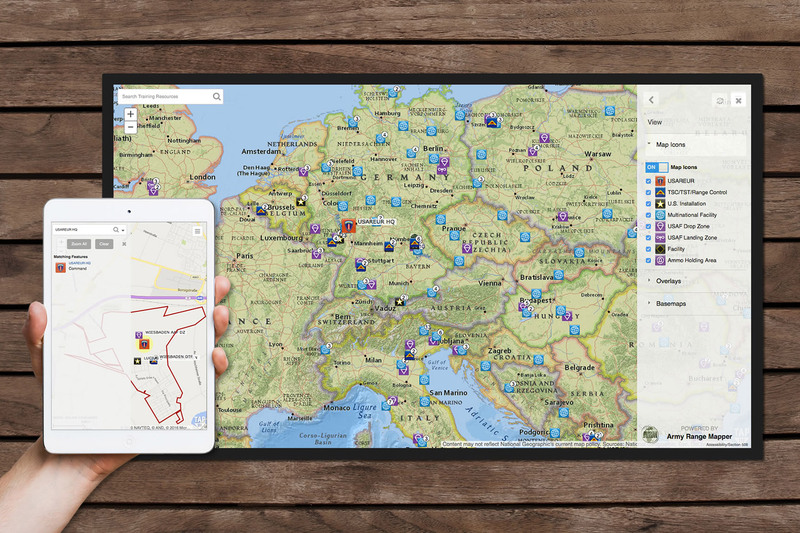 Tierra Plan developed a suite of web mapping applications for the US Army Europe (USAREUR) 7th Army Training Command (7ATC) Sustainable Range Program (SRP). The Army Range Mapper and Tap In are Army accredited applications we developed that provide an integrated one-stop solution for finding training resources throughout Europe and Africa. Over 1,200 facilities and training sites are easily searchable from a map interface using keywords, titles, geographic attributes, and scheduling inputs. Geospatial data from numerous sources including Esri and WMS map services, commercial and DoD hosted basemaps, and Digital Globe Enhanced View imagery from the National Geospatial Intelligence Agency (NGA). 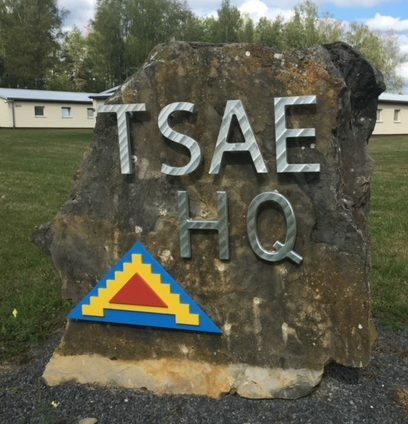 Searchable spatial data includes installations, facilities, TSCs, and current and future exercises. In the map interface, users search for training areas and facilities, view location-specific information, download related PDFs (such as Standard Operating Procedures (SOPs), handbooks, topographic maps, access maps). Users can also share lessons learned and “TTPs”: Tactics, Techniques and Procedures. Tap In also integrates numerous disparate external data sources including the Range Facility Management Support System (RFMSS), the Resource Library document repository, feedback and lessons learned, and environmental and live-fire capabilities, The data-rich map interface lets planners easily view scheduling information for any training facility, installation or Training Support Center (TSC). This innovative GIS application has given soldiers and planners instant access to information that was previously difficult to find. 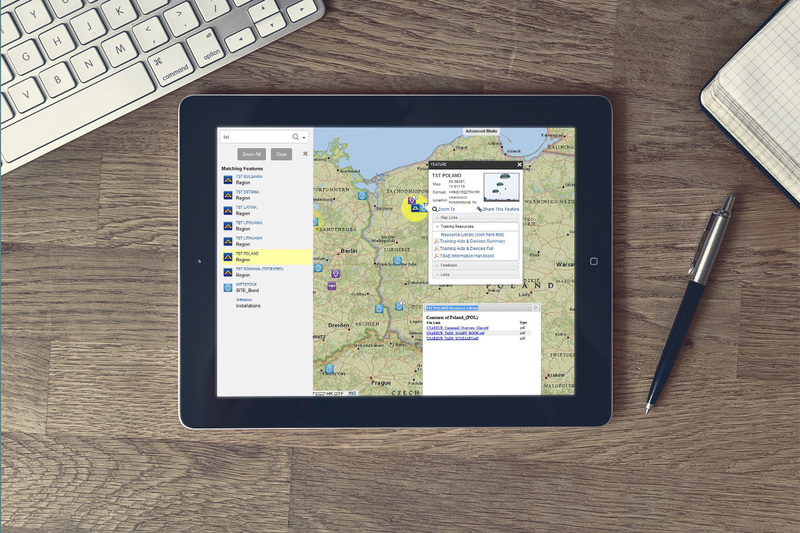 Providing such a rich set of information from multiple sources in one interface improves planning, training, and operational readiness. Tap In is also fully configurable. Administrators can add and edit training facilities and sites through a simple, secure administrator interface. 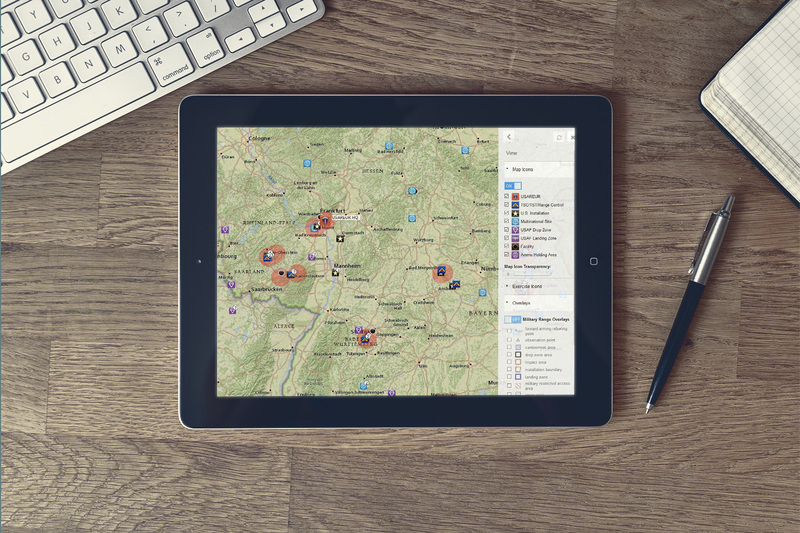 Supplemental information such as training events and capabilities can be uploaded in CSV format and displayed on the map without any GIS expertise.